So, I finally got a chance to try Lagavulin, and I got to try the entire bottle, because guests at ranchomojo have been rather scarce, of late, and my wife can't stomach scotch whiskey. TBH, I'm sometimes sorry I introduced her to bourbon, cuz we both love it so much that it's hard to keep it on hand, but that's...another thread. The thing is, Lagavulin is an Islay single malt. Yeah, I probably can't pronounce it properly, either, but McClelland's Islay single malt is virtually identical, and about $30 USD as compared to Lagavulin's $100+ USD. I just thought you should know, if you're a peat fan, and surely no true Scotsman could fail to appreciate the difference. For myself, I love the peat, whenever I'm in the mood for that, but mostly, I'm either after the Bushmill's or the bourbon. So here's a toast, to friends far and near, and those held most dear, to loves won and lost, whatever the cost. Slaintè! I've recently started drinking bourbon... there is a nice local distillery about 8 miles form my house. I don't drink often, the stock I have now will probably last me several years. He knows not where he's going, for the ocean will decide, its not the destination, its the glory of the ride. My taste buds are averse to anything distilled. Other than distilled water, I can't much distinguish between the ine family (gasoline, turpentine, Listerine, and margarine) from the distilled spirits! Peaty!? I would probably describe that as mouse droppings in a moldy basement. Bourbon? The vinegar of corn syrup? My palette is only as sophisticated as a beer on a hot summer day, or Lambrusco with a fancy Italian dinner. Tried lots of single malts and can't say I've found one I dislike, but favourites are The Balvenie, Auchentoshan, Glenlivet, Jura, Glenmorangie, Glenfiddich. Actually, Japanese whisky has come a long way! 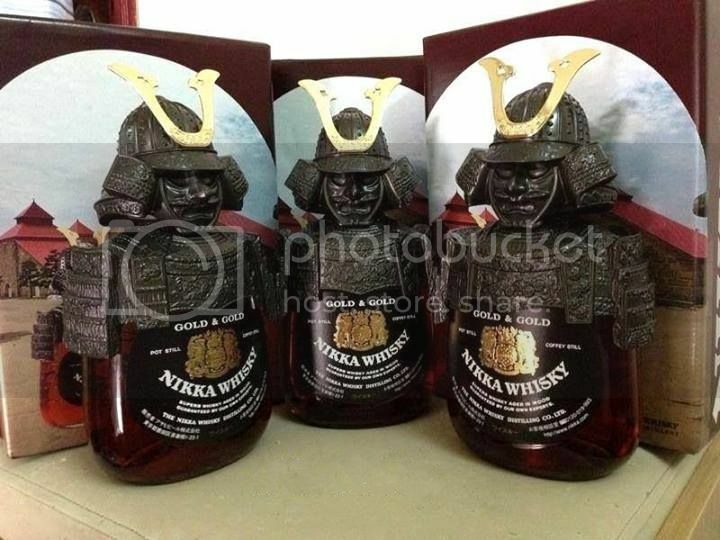 I was given one of these Nikka Samurai bottles several years ago. The whisky didn't last long but it makes a great ornament. Good for refilling too. The Nikka founder studied the art of distilling malt whisky in Scotland. It's blended (I don't usually drink blended, 'cause I don't normally like it) but this is a very acceptable tipple! Looks like I picked the wrong week to quit drinkin.